Oyonnax's Irakli Mirtskhulava with Caolin Blade of Connacht. 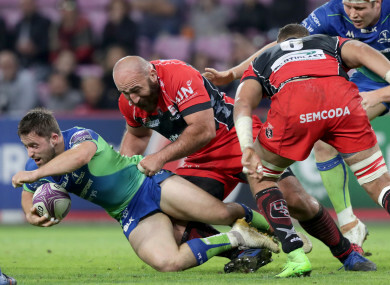 CONNACHT GOT THE Challenge Cup win which coach Kieran Keane hopes will kickstart their season when they eased to a bonus point victory over Oyonnax. Connacht led 22-15 at the end of a free-flowing first-half, which saw Keane’s men race into a big lead before being hauled back. These two sides had only won a game apiece in their domestic leagues going into this clash and it looked as if Connacht would coast home when they opened up a 19-3 lead after just 23 minutes. Out-half Christopher Ruiz gave Oyonnax an early lead with a penalty at their adopted home — they switched the game to Geneva to carry out work at their own stadium — but it was all Connacht from there. Matt Healy crossed for the first try when he switched wings and another excellent backline move put the other winger Cian Kelleher over after 11 minutes. A penalty to the corner yielded another big dividend when Eoin McKeon crashed over and the margin of victory seemed all that remained to be decided after that. But Oyonnax centre Ulupano Seuteni countered for a try and that lifted them, with winger Axel Muller crossing to cut the gap to 19-15 after half an hour, before Andrew Deegan converted a penalty to make it 22-15 at the interval. Another Deegan penalty extended the lead four minutes after the restart and the bonus point was secured after 53 minutes when Healy darted over for his second try of the match after another penalty to the corner. Deegan’s boot kept extending the gap as Connacht got their Challenge Cup campaign off to the perfect start, with Darragh Leader getting their fifth try at the death. Oyonnax: Silvere Tian (Jeremy Scalese ’58); Tim Giresse, Ulupano Seuteni, Roimata Hansell-Pune (Mickael Romera ’70), Axel Muller; Christopher Ruiz (Anthony Fuertes ’22), Julien Audy; Giorgi Vepkhvadze (Vincent Debaty ’46), Benjamin Geledan (Guilhem Bourgois ’53), Irakli Mirtskhulava (Thomas Laclayat ’33-40, 66); Geoffrey Fabbri, Christian Njewel (Kerry ’53); Bilel Taieb, Valentin Ursache (Romain Gauthier ’58), Maurie Fa’asavalu (Shay Kerry ’22-30). Connacht: Darragh Leader; Cian Kelleher (Rory Scholes ’69), Eoin Griffin, Tom Farrell (Craig Ronaldson ’58), Matt Healy; Andrew Deegan, Caolin Blade; Denis Coulson (Pete McCabe ’76), Tom McCartney (Shane Delahunt ’65), Finlay Bealham (Conor Carey ’76); Ultan Dillane (Quinn Roux ’65), James Cannon; Eoghan Masterson, Eoin McKeon, John Muldoon (James Connolly ’70). Email “Connacht get Challenge Cup campaign off to winning start in Geneva”. Feedback on “Connacht get Challenge Cup campaign off to winning start in Geneva”.